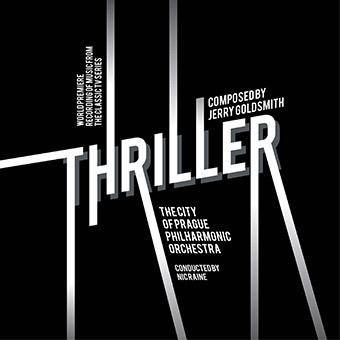 The 477th Soundtrack of the Week is this brilliant re-recording of several Jerry Goldsmith compositions for the television series Thriller. Re-recordings of film music from conductor Nic Raine, the City of Prague Philharmonic Orchestra and the Tadlow label are always intensely rewarding. With this program of relatively obscure early Goldsmith, they've done something really special. While a complete and chronological collection of every piece of music, ideally from the original recording sessions, would still be very desirable, this CD of three tracks each for six different episodes (each including a suite of cues) is exhilarating, brilliantly produced and a very listenable album. "The Grim Reaper" has some of the modernistic small-ensemble ideas that Goldsmith loved so much back in those days, as well as some Herrmannesque lyricism and use of space. There are some intriguing uses of instruments such as accordion and exceptionally strong violin playing. "Hay-Fork and Bill Hook" allow for some pastoral themes and lovely melodies that are alternated or layered with stings and other suggestions of menace and suspense. Fiddle traditions as well as traditional European music seem to have been inspirations and the flute does a lot of work as a primary voice. After that we go into the "Well of Doom". It opens with dark, low and loud instruments surging out of the speakers toward the listener. There's also some lovely ethereal harp and vibes playing but the looming and bellowing voices of the lower register brass instruments are never far away. The harpsichord gets a workout in "The Poisoner" as does the string section. Sometimes it sounds like the strings are blended with an electronic instrument as well. This is one of the most relentless dramatic of the scores here, very strong and solid. The last episode featured is "Yours Truly, Jack the Ripper", which has a Weill-like theme in 3/4 and some spacious and extended playing from effective combinations of just a few instruments at a time. Percussion is used especially well here. Finally there's a medley of all six of the "End Titles" from these episodes. This is really a fantastic recording! We can only hope there are more like this to come!